The premise of this book reads similar to another book, Taft 2012. In that story, Taft lies down on the White House lawn for a nap and wakes 100 years later, then runs for President again. I doubt many people remember Taft as history's greatest monster, though. It starts the same here, one day Hitler wakes up fifty years after WWII in the middle of a German field. No idea how he got there, it's never really explored, but he's in a Germany full of Starbucks and iPhones. He hasn't changed, but the world has, and people view his ideals and rants as antiquated humor rather than take it seriously. Not unlike the progression of "Being There," he ends up on TV and becomes a viral sensation. This is a satire, although at times I wondered about the actual target. Hitler returns to the world thinking he can start over and motivate Germany toward his ideals, while the people around him take his every word as method acting. 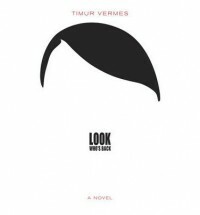 Some reviewers here have accused the author of trying to make Hitler "likable", but if you read the book you find he isn't. There is only one moment in the book where you think he has compassion for a Jewish person, but he eventually rationalizes that fleeting moment when it's learned the person has a Jewish ancestor and may not be fully Jewish. The people around him may show sympathy toward him, and in the end you presume they think he's deluded and convinced himself he *is* Hitler. I don't think anybody truly likes the man - they like what they perceive he provides: entertainment and buffoonery, and ultimately money for themselves. I didn't find this brilliant satire. I think it lacks something from being told entirely through Hitler's POV. The people around him - the showrunners, the press, etc., come off as two-dimensional, but in the end perhaps that is the point. I also didn't like the ending. You would expect some kind of comeuppance but it doesn't happen. The end gives the feeling Hitler will continue to live, unbeknownst to himself, as a satirist with people laughing at him rather than willing to take on his cause. It fizzles.